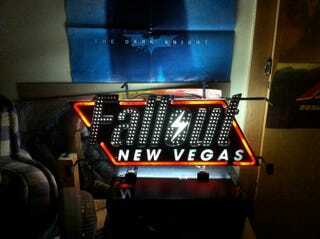 The Fallout: New Vegas sign we gave away last month has arrived to christen its new owner's digs. Kotaku reader ipottersmith, the contest winner, just shared this pic. Definitely beats the crap out of an Animal House poster from Spencer's.